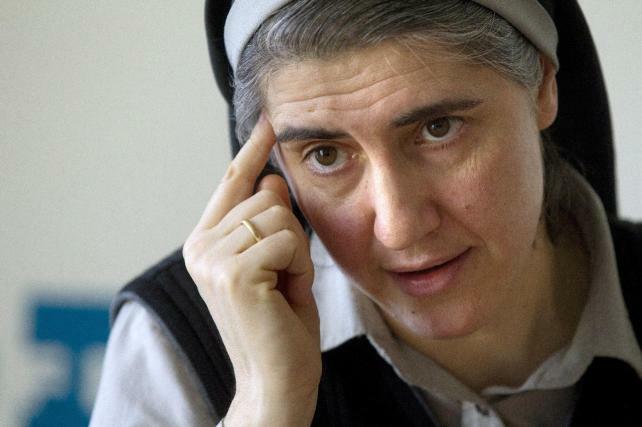 International Movement We Are Church: Teresa Forcades: "Institutional clericalism and structural misogyny are palpable in the Church"
Teresa Forcades: "Institutional clericalism and structural misogyny are palpable in the Church"
Teresa Forcades leaves no one indifferent. The Benedictine nun, who this week visited Madrid to present Diálogos con Teresa Forcades ("Conversations with Teresa Forcades" - DAU), written by Eulàlia Tort. A book which reflects her various views and some of her criticisms of the Church, whose "institutionalized clericalism and structural misogyny" she denounces first. As for the debate over abortion, the nun claims that "no one should be involved in a demonstration calling women who abort murderers without showing a certificate stating that they have given a kidney to save an innocent life." Known for her defense of Venezuelan Hugo Chavez, who died recently, she calls him "the leader who has gone through the most democratic validations" and confesses that she prays that "the achievements of the Bolivarian revolution aren't thrown away." On Sunday you presented the Spanish version of the book Converses amb Teresa Forcades("Conversations with Teresa Forcades"), which was a great success in its Catalan version. Yes, I presented it at the Entrevías parish, with Javier Baeza. It was a sort of lecture, talking about the points it seemed important to highlight, followed by a dialogue. This is what's generally most interesting to me when I make public appearances -- presenting ideas that I want to convey, but also using dialogue to help me realize what concerns people have. Being so young, how did you come to write a sort of biography? Well, it was an initiative of the publisher, and moreover it was a mistake on my part, because I received two e-mails on the same day with two publishers' proposals. One was to have an exchange of letters (a dialogue) with a philosopher on subjects of general interest -- the meaning of life, death, love, freedom ... I found it interesting, challenging, being able to establish that kind of dialogue with someone who thinks differently. So I thought I would say yes. That same day, I received another request to do a book of biographical types of interviews, and in principle I thought, as you said, that I'm too young to have a biography, and also that in general it seemed to me that I didn't have to promote initiatives in which I was the star. That the subject wasn't me myself. Therefore, my intention was to say no to the latter and yes to the former, but I mixed up the e-mails. So, two weeks later the publisher of the book came to the monastery, and I spoke to him as if it were about the book of philosophical conversations, until I realized I was wrong. But since he was already there, he showed me a script. I had already been asked before by other large publishers for a book of interviews, and I had always refused because all I saw behind it was interest in marketing the "popular nun". But this publisher wasn't like that. His intention was precisely that the audience that follows me because of the medical and pharmaceutical denunciations (on [the influenza A vaccine] and other things) could also access my more theological side. And vice versa: that the audience that follows me for the more theological side could also access my feminist side. He saw that I had audiences that sometimes didn't meet each other, and so he found that diversity interesting. He put it in a way I liked: "I believe no one will agree with everything you say," he told me, thinking of the stereotypes. And he told me he found it positive that there are people who disagree with one part of my thinking, but nevertheless are comfortable with a different part. You are known above all for your political positions and denunciations, but in the book there is also intense and interesting theology. Why do you talk about the subject of the Trinity in particular? Because it's my subject, my doctoral thesis. And that means I've been researching it for 10 years, because it was also my minor dissertation topic. I've had a book published called La Trinidad hoy("The Trinity today"), which was my undergraduate thesis. That was already three years of research. That is, I've devoted 10 years in all to what in theology we call the mystery of the Trinity, but not just as abstract theoretical entelechy, but because in the 17th chapter of John (which is possibly the shortest one), at the beginning of the Passion, Jesus says 4 times, "Father, that they may be one as we are one." And that's fascinating. For anyone who gets into Trinitarian theology -- this mystery that seems so inaccessible and completely alien to our everyday life -- it turns out that this revelatory text tells us through Jesus' voice that we must be one. But the Father, the Son, and the Holy Spirit are one in way we can't understand. It's a distinctive, unique and extraordinary unity of the Divine -- and it's hard for us to put it into words. So the question is how the Catholic Christian community will be a unit of the same intensity and quality as their unit. What is Jesus asking when he tells us to be "one"? He doesn't say it once, but four times, and it's almost like his last will. That is what interested me the most when I studied the Trinity and wrote the most extensive book I've ever written, which is the publication of my doctoral thesis. Now I'm giving some courses at the monastery on this subject, called "The Trinity as the foundation and interlocutor of personal freedom". The freedom that defines us as beings who are not subject to the causal chain (because we don't act just because we have hormones and neurotransmitters; there's something that's called the spirit). My knowledge of medicine helps me to understand the extent to which we are subject to biological conditioning, but we never are from an absolute, total or determinist perspective. There's always the possibility of getting out of that causal chain, and that's what we call the spirit. And it's essential. Isn't this unity in what's essential difficult from the earthly church point of view? Difficult yes, but not impossible. It's difficult even in the Gospel. If anything attracts me in the Gospel, it's its realism. We Christians don't have an unreal narrative, in the sense that it's not rooted in reality, because we see, for example, that Jesus not only had difficulties with his enemies, he had them with his own. We are his followers, so we need not lose heart as if difficulties were anomalies that weren't predicted in God's plan. I think that we have to face the difficulties in the very bosom of the Church with a certain sporting sense, each one analyzing what we believe God is asking of us, being faithful to the end and stopping lamenting. The reign of conscience itself? That's it. Without ever expecting that solutions will come from outside and above (from the structures). If they come, great, because the structures seem somewhat consistent to me. I disagree with people who say yes to spirituality but not to religion or the institution, because I think spirituality can't be lived out alone; I think it has to be shared. Living out spirituality alone is a contradiction for me. And if you live only with your friends, it is also a spirituality that's too closed. And if you want it to open you up to others, you'll have to establish some agreement to see where and when we'll meet. There you already have an institution, albeit minimal, but an institution. So I think that the debate about institutions gets off track easily, so I don't go there. What seems essential to me is deciding which institution, who governs it, how those who govern it are chosen and how they are changed when they don't do what they ought to do, under what regulations and under what criteria does this institution function, etc..
That is, the issue isn't that there are too many bishops conferences but rather, how they're organized? Exactly. We should have the freedom to evaluate it. I think that in our Church today there's a structural part that's outdated, what Cardinal Martini before his death called "the structural anachronism of the Church." That institutionalized clericalism I see and feel. The institutionalized misogyny too. How have you experienced the election of the new Pope? Before the election, my interest was explaining the need to stop looking towards the top. Because if Tarancon said that we were going to get torticollis from looking at Rome, our necks are also going to hurt from looking to the top, waiting to see if we get a Pope Messiah. John XXIII was the champion of the changes needed in the Church of those times, but I think John XXIII would not have been able to do that without the support of the base communities that had already been working half a century for change in the liturgy and in theology. Do you think a similar movement is happening today? Yes. Ever since, after Vatican II, this involution began, this slowdown that threw us 20 or 30 years back, movements have appeared that claim and practice a different style of Church. The women's and feminist groups are one example, but there are many more that are calling for democracy within the Church. Liberation theology, which appeared after Vatican II, is obviously another example. Some have declared it defunct but I think that, far from it, what it has done is partly die of success since it has inspired social and political changes on the Latin American continent that are now giving hope to many other countries. Francis' messages about a poor Church for the poor, that is stained with mud and smells like sheep, aren't they like the basic message of liberation theology, or do you think it could never be the predominant theology? The preferential option for the poor was a conciliar expression that upheld liberation theology at Puebla and Medellin. That's where it took root most clearly. And it's possible that now, with this papacy, that church tradition might retake its rightful place. What would you ask of Francis, if you were to meet him? I would ask him to go ahead with this commitment to poverty, not just through symbolic gestures like those he's been making up to now, but also through structural changes. And that he would dare to alleviate that clericalism and that structural misogynism that I spoke of as the main problems. When talking about effective equality, is it essential that women be able to be priests? Of course. When the first ordinations of women in the Episcopal Church (who are the Anglicans in the United States) began, after Vatican II, was when Paul VI saw it coming that -- if the North American Anglicans (with whom we have no significant theological separation doctrinally) had made that decision, the same demand would come to Catholic circles. So he asked the Pontifical Biblical Commission to study this subject in the Scriptures, to see whether or not there was anything contrary to that ordination. This commission did its study and presented its conclusions, which said that there was nothing contrary to this in the revealed word. But the pope thought, motu proprio, that this wasn't proper, and therefore it was banned in the Catholic context. That door was closed. Later we found out there were subsequent statements that indicate this wasn't closed quietly, and in fact no pope has made that a dogma today. When that type of maximum magisterial authority is made, those of us who believe this must happen in the Church will have a problem. To date, we don't. The reality of the structural Church is misogynist, clearly. On the International Theological Commission, which advises the Congregation for the Doctrine of the Faith, there are a couple of women, out of 40 members. There isn't parity, but there are women whom the Catholic Church has recognized at this time with the authority, at least, to advise those who directly exercise the magisterium. Also, there have been women at the head of important international church bodies. The only possible theological reflection for deeming the possibility of women's access to the priesthood unsuitable is the issue of in persona Christi, the power to act in the person of Christ before the congregation, when Christ was incarnated specifically in a man. According to this, a woman could not represent that incarnation of Christ as fully, and present herself in his name before the congregation. But the Rule of St. Benedict already spoke of the abbot and the abbess in the monastery, that is, this isn't a 21st century innovation. Since the 6th century, it's been clear that in a monastic community -- at least in the Benedictine tradition -- the abbess isn't the "administrative superior." The concept of an abbess has this theological weight of a person who is placed at the head of her community representing Christ. That's how the Rule of St. Benedict puts it. Therefore, it's nothing new to think that a woman could represent Christ in front of a community. It's already been part of the Benedictine tradition. How do you feel in the Church? Do you think many people think the best thing you could do is leave it and lead a civilian life? The first level is my integration in my community. That's first because it's my daily life. My daily everyday experience of what it means to be integrated in the Church or not is this, my community in the mountains of Montserrat. Luckily, my community is a diverse community, and therefore not everyone applauds me for what I think or do, but it was very significant that, when the abortion controversy happened and I made some statements, the community met to study the document I was thinking about publishing in my name, without making anyone else responsible, and the abbess told me that more or less half the community didn't agree with what I was expounding in that document, and the other half hadn't understood it, but they both agreed that they wanted a Church where each one can say what he or she thinks. That is, everyone, whether or not they had understood the argument and why I would have expressed myself publicly on this subject, agreed that they wanted a Church where people could express themselves with the trust of a family. That is, with due respect but with the freedom of spirit of which we Christians should be a torch. One should be able to see that our freedom isn't just theoretical or desired, but also exercised. That people in their communities can say what they think, something that doesn't happen in many universities or businesses, to say nothing of political parties. That is essential. Have you been accused because of your public presence, like what is happening to Sister Lucía Caram, because of being a contemplative nun? At any time over all these years in which you haven't been exempt from criticism, have you thought of leaving the Church or having a different relationship with it? I'm never going to leave because of criticism. My entering the monastery wasn't the result of my own reflexion, but an interior experience of vocation, that is, I felt I was called. Whether that calling was objectively real or not is something I don't think I'll know until the last judgement. Perhaps then Jesus will come and tell me, "Hey, it wasn't me who was calling you." But then I would say to him, "Well, I thought it was you, and for me, it was enough to be faithful to that." Therefore, I haven't thought of leaving the monastery, much less because of these sorts of external criticisms. As for the other thing, I think it's true that the vocation of a contemplative nun takes place mainly in the silence of a monastic cell, where the person trusts that her prayer and her interior life given over to God are fruitful for the world. I've seen that with theological work -- that when I've done it, it's given me more pleasure than doing interviews, because it's a much more interesting and revealing challenge to put yourself in front of the texts of the great masters of the tradition, trying to dialogue with them inwardly, and letting your current, 21st century problems echo in another era. And praying that this might bear fruit. Let's say that doing six hours of daily prayer in this context wouldn't work for me, but Benedict's Rule, as everyone knows, is ora et labora. That is, that the desideratum of the Benedictine is continuous prayer, in the sense that you don't need to stop working. Right now I'm giving an interview, but at the same time I should be aware of the presence of God and his concrete love, which are always my ultimate reference points. That awareness of the presence of God is what is asked of a nun, as it is asked of any Christian. The Benedictine tradition, as I said, doesn't value work only as necessity for survival, but it includes it as part of the usufruct of creation. Because God's work invites us to be co-creators. As such, work is also God's work. This week you put out a political position manifesto with Arcadi Oliveres, talking about the Catalonia independence process, the crisis, political power...How did the manifesto arise and what are your goals? In recent months, the crisis situation has been growing and there are many people who seem worried and think it's an exceptional time, that this isn't the normal situation, and there are many people concerned to see how far it will go. According to INSOCAT (Instituto de Estudios Sociales de Cataluña), in January 2013 there were already 12% in destitution and 18% in poverty (which doesn't include the percent in destitution) in Catalonia. That is, 12% of people who if they don't line up somewhere this day, don't eat, and 18% of people with significant difficulty making it to the end of the month. That adds up to 30% -- a number completely opposite to the perception we have of a society of well-being. Instead it looks like what Lady Margaret Thatcher, who died recently, called in her time "the society of the two-thirds". According to her, to rule a society efficiently, you needed to direct your policies only to two-thirds of the population, which would give you the majority. She believed that if one tried to include the other third too, one was entering a dead end street because there would always be poor people and "unsalvageable" people in society. I agree about not believing in a dream society without problems, but from there to accepting that we will always have poor people and that there will always be 30% who are left out, that's different. A Christian person should always monitor themselves, make their examination of conscience each day, and not relax, thinking that things can't change and it's not worth working for it. That's what Margaret Thatcher was encouraging us to do -- forget the other third. Starting from this situation, both Arcadi Oliveres and I went to see the political parties to try to be included, at least symbolically, to support a candidacy. Neither he nor I had ever done this, nor had we thought about doing it. What I have talked about publicly is an indefinite general strike, because it seems to me that a democratic society has the right to exert its sovereignty. Democracy says that the political subject is the people, and that they delegate that power to their representatives. Therefore, if it's the people who wield the power, they have the ability to take it peacefully at a time of crisis such as the one we're in, when the government is discredited (not just the central one, but also the autonomous ones). It's not a party problem; it's a problem of representative democracy from the beginning of the crisis to now. Decisions have been made, one after another, that go against the general interest and have been made in opposition to the electoral programs. For me, that's enough to invoke not just the right, but the duty of an indefinite general strike. We aren't a democracy of minors; it's not that we can do something but that we must do something. We have the responsibility towards the generations to come, just as our predecessors defended the freedoms their children would have. So, in conversations with Arcadi and other people, we considered the possibility of organizing an indefinite general strike, of a Catalan or state scope, uniting with other platforms. But it happens that in democracy there's another alternative, which seems more in line with its own procedures -- helping to promote the candidacy of a political party that would run in the elections with the sole political objective of declaring the constitutional period. Because an indefinite general strike isn't a goal in itself; it's a political tool to achieve the delegitimation of the social contract in which we find ourselves that has allowed all this to happen. In that way the citizenry, freely and peacefully, would decide to change the rules of the game. And changing the rules of the game means changing the Constitution. The Constitution has already been changed expressly to put the benefits of the private financial entities ahead of the welfare of the Spanish population, and the change was approved by the PP [Partido Popular], the PSOE [Partido Socialista Obrero Español] and CiU [Convergència i Unió]. That is, the Constitution has already been modified, in a neoliberal mold, therefore we don't have to ask for tweaks. We need to change the framework in which we're operating. And that change in the Constitution ought to be made through a constituent process, by creating assemblies. Not from above. And let the people vote on and endorse this new Constitution. This has to be done from legitimate power. That's why the indefinite general strike is a means I don't reject but I think it fits less with the spirit of democracy, first because there are a number of vulnerable people who would suffer (because there are people who eat with their daily wage and if they go on strike, they don't eat). How is this arranged without leaving victims by the roadside? What would be the representativeness of this general strike? If the government falls, who is the legitimacy passed on to? That's not clear. And then there's the issue of violence. In Catalonia, there's already one woman, Esther Quintana, who lost an eye in the last demonstration. That absolutely must be avoided. That's why I think the alternative is a candidacy submitted in the elections. If the people don't vote for it, nothing has happened here, because without the popular will, this change would not be possible (or desirable). But it should be shown at the polls, which is what should be in a democracy. Thus it would be legitimated to change the framework. In the case of Catalonia, the problem comes because it's not a sovereign state. Therefore, we can't do this if we don't declare ourselves independent unilaterally. This is what the manifesto says, which explains the reasons (poverty, social deprivation, the cuts in freedoms and social budgets...) why we believe it's necessary to change the framework and the social contract. That's why we are proposing to Catalan society that it set up these grassroots assemblies to encourage the citizenry of Catalonia to begin this process. When this process begins, Arcadi and I will be present, and if there's anything we think we don't have to support, we'll express it publicly. If this should come about through the channels we're expecting, then at its time it would culminate in a slate that would have as objective opening a constitutional period. And to be able to do it peacefully, democratically, seeking the necessary support, always with the idea of being a sovereign and supportive state (for me, exclusionary nationalism isn't worth it, whether racial or any other type of supremacy). We Catalans are simply a group of human beings that now has the chance to break the vicious cycle of growing neoliberalism and social precarity, as well as making an effective historic claim. I think it would be fantastic to achieve all these social demands at the level of the whole Spanish country, I would collaborate with it, but for me independence would continue to be important. The motive is like the Trinity we were talking about earlier -- the Trinity is a challenge at the cultural, intellectual and philosophical level because it tells us that diversity isn't incompatible with unity, but rather its condition of possibility. This, in the ancient and contemporary philosophical world, is unheard of. In the classical world, unity was conceived of as uniformity. Hindu philosophy, on the other hand, speaks to us of the unity of all, that is real, while diversity is an appearance. Also the Presocratics sought in the elements what was real beyond the appearance of difference between fire, water, air...Nowadays it's problematic to talk about unity in diversity but for the opposite reason -- contemporary philosophies doubt that unity is real. Because it's thought that we live in a fragmented world and that's how it is. Wouldn't it be more logical, then, to work all together in this diverse state, showing off the unity in diversity that you're talking about? Wouldn't Catalan separation bring with it serious economic problems, at least in the short term? Don't we all currently depend on supranational bodies like the European Union? Well, the manifesto distinguishes Europe from the European Union. It's a call that won't materialize if people don't take it as their own. What we aren't going to do is encourage people by saying that the Gini index could be reduced if it's not possible. We have to get to the reasons for this "it's not possible." And the European Union currently, with its troika and its arbitrary impositions (because they obey the criterion that the European Central Bank, instead of lending money directly to Spain for the famous bailout, has to lend it to intermediary banks, with a 1% interest). That is, criteria that are unacceptable in a crisis case like the one we have. Therefore, we have to be willing, in the constitutional process, to say no to the European Union (which isn't the same as saying no to Europe). There are many European countries that aren't in the European Union. And the European Union needs to make some internal changes. The coordination of this project with the rest of the peoples of Spain is perfectly plausible; it's simply a question of through which strategy it would be most viable. Do you think a German style federated state for example, would be possible? There may be a cascade of situations that demand something similar, and then we would have to see if it fits in the ongoing political process. A kind of "Confederation of Iberian Republics." Why not? There are many possibilities. The business of the Catalan state itself seems to me important (I'll say it openly), because of the history behind it. If there's a will for solidarity and union, and not that racist or supremacist nationalism (for me this thing about the Catalans being genetically different is ridiculous; it's baseless), this must be demonstrated in practice. In the deepest sense, it doesn't matter if this is done from its own state, from a confederated republic, from a federal state or from another European Union or European model. The important thing is that the different peoples have the capacity to make the decision and grassroots political authority. Republic, without a doubt. When I was 15, before my first experience with the Gospels, I had been taught that the Catholic Church was an outdated institution, like the monarchy, that still exists but has no reason to be. Later, my experience with the Church led me to think that it isn't an outdated institution, but real and alive, but my experience with monarchy led me to conclude that it is an outdated institution. Are there limits and choices for abortion? What do you think of the Church's position on this? It doesn't seem to me that abortion is a right (because it doesn't have to be and it doesn't have the authority to be) or that it's something desirable either, much less trivial. But what I'm raising, which is what some important professors of bioethics have raised as well, is that the case of abortion is a contrast between the principle of life (which is basic in both Catholic doctrine and human rights) and the right to freedom and individual self-determination (equally fundamental in Catholic doctrine and human rights). These clash when a woman is raped, for example, and has an unwanted pregnancy. Then the guideline or the jurisdiction of Catholic teaching has to take into account these two basic values. My contribution to the reflection has been wondering, knowing that these principles are opposed to one another, if there's some case in which Catholic teaching wouldn't always have to give priority to the principle of life, but could also respect self-determination. There's a case: a father who might have a child who might need a kidney transplant and could give him one himself. Nowadays giving a kidney reduces life expectancy a lot, that is, the father would be losing his right to life in part by exerting his right to dispose of his own body. But, if he were not to give the kidney to his child, he would also, then, be harming his child's right to life. Would the Church excommunicate him for not doing everything possible for his child to live? No. This doesn't happen. There are cases in religious orders where someone has needed a kidney and his companions haven't given it to him. This puts what Jesus said on the table -- that it's easier to load burdens on others. Therefore, I think no one should join a demonstration that calls women who have abortions murderers unless they show a certificate saying they've given a kidney to save an innocent life. There are many men who have written me talking about the issue of abortion, saying that, if the could save an innocent life with their body, they would do so without hesitating. Well, I encourage them to do so immediately. There are between 3 and 4 million people in the United States alone (many of them children) who die each year because they can't get the kidney they need. What do you think of the possibility of married priests in the Catholic Church? The compatibility of priestly ministry and matrimony has been viewed more or less broadly at various times in the Catholic Church and there are denominations where this is allowed. The problem wouldn't be theological so much as of tradition. What would have to be thought about is how the issue of how this couple would become part of the life of a parish would be framed. I've seen some cases in the Protestant environment where the woman fulfills a role I wouldn't like her to fulfill in the Catholic environment. There's a very interesting study on this, which is called The Hidden History of Women's Ordination, which also deals with aspects of this sort, how for example the son of the pastor ends up being the next pastor, etc. The subject of inheritance would have to be discussed. The Catholic Church has a particular profile because of having opted for years against marriage for priests. Now, as with everything, it would be about opening the debate and looking deeply, beyond dogmas and stereotypes, at what possibilities there are and what wealth it would be for the Church to have married (and women) priests. You've positioned yourself, if not as a defender of Chávez, as a person who has given a different discourse from the rest of the West with respect to the recently deceased president. What are you expecting in post-Chávez Venezuela? It's a huge challenge -- building a democratic society that really is one. What I value most in the process Hugo Chávez began was what I found in Venezuela in 2007, the first time I traveled to the country, and it's that people in the street talked to me, convinced that their political ideas, their desires and their wishes mattered to the political process of the country. I think it's critical that we expand this awareness of political protagonism in our country. And I found that in Venezuela. That's why I was impressed in a positive way and thought "that's what we need" (not just in Spain or Catalonia, but worldwide) -- waking up to political realities. And that's what's happened over these 15 years of the Bolivarian change process that must now show its maturity. It can't depend on one leader (because Hugo Chávez, although reviled by many people, has been a charismatic leader able to reach the people and produce change). When he's accused of being a dictator here, that's completely false; it's contrary to the facts. He's the leader who has passed through the most democratic validations (monitored and observed by the Carter Institute). That is, there's no doubt about the democratic quality of this process. What there may be doubts about is the consolidation and maturity of the process, beyond personalism. Now the Venezuelan people have to measure up. Here, I'm praying that this will be resolved not only peacefully but also so that the achievements of the revolution aren't thrown away. What is the Church Teresa Forcades dreams of? A Church united in diversity, as I've said before on the political level. The ecclesiology of Vatican II, the book of Revelation, and the Trinity tell us we aren't slices of a bigger entity but that each local church is the Church of Christ, and as such must have that dignity and that awareness of responsibility. I would like for the Christian community to really be structured in units that were in communion and harmony with the rest, but that were able to fulfill the principle of subsidiarity (which, for sure, is a concept coined in Catholic social teaching, to prevent the state from saying how children have to be educated). That is, that to defend the right of families to educate their children in religious schools, the concept of subsidiarity was developed, which amounts to saying that if the families can do it, that the state not do it.